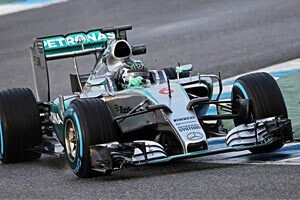 The Mercedes AMG F1 Team unveiled its 2015 Formula One World Championship challenger, the F1 W06 Hybrid, ahead of the first day of pre-season testing at the Circuito de Jerez in Spain. Drivers Lewis Hamilton and Nico Rosberg revealed the seventh Silver Arrow to compete in the Formula One World Championship to the assembled media, with Nico Rosberg then taking the wheel for the opening test session of the 2015 season at the Spanish circuit. The W06 is a comprehensive evolution of its predecessor, thanks to the relative stability in the regulations after the major power unit overhaul the year before. Still, that doesn't mean the team stood still, with Mercedes using up 25 engine development tokens during the off-season, and then using their remaining 7 tokens during the season for further upgrades. Some regulation changes did however impact the car's design, resulting in a lower tip of the nose cone. With FRIC also being outlawed halfway through 2015, the team also had a chance to redesign the suspension elements and optimise them without FRIC, rather than simply removing the system as they had done when it got banned. All evolutions combined resulted in a chassis that was still the best of the pack. On the drivetrain side, Mercedes retained the same, winning philosophy on the new PU106B engine, with the compressor at the front of the engine, and the turbine at the back. The MGU-H continued to be within the V of the engine. The MGU-K maintained its position close to the floor, on the left hand side of the cylinder block. The engine also features a much larger inlet plenum due to the adoption of variable inlet trumpets (something Mercedes willingly opted not to use in 2014) while on the exhaust side, the collectors have changed from log-style to equal-length exhausts. 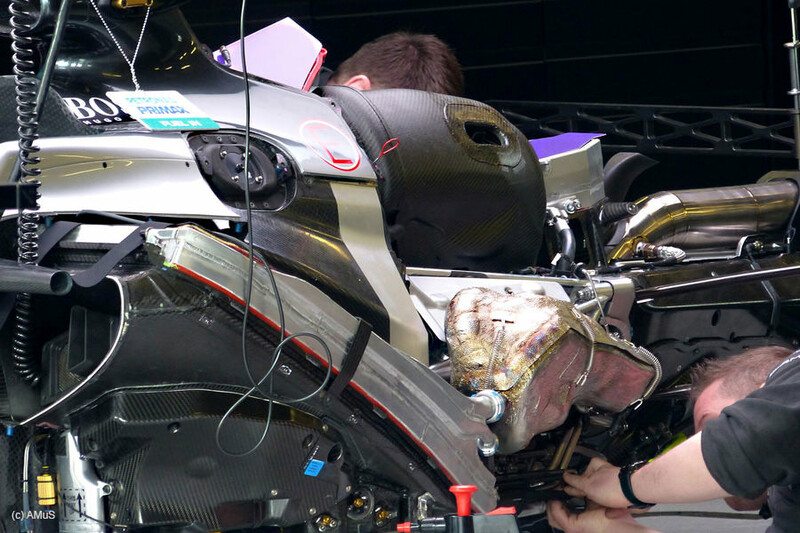 The power unit inside the W06 also continues to feature an air-water intercooler located vertically, in between the oil tank and the engine block, and mounted inside the monocoque. This feature is unique among all cars that use the PU106B, knowing that the others have opted for an air-air intercooler installed in the left hand sidepod. The layout is another compromise, with the air-water system being more compact, but also (likely) heavier. From Mercedes' point of view however, Paddy Lowe insisted it was one of the elements that made the difference for the W06. The 7 remaining development tokens for the power unit were used at the Italian Grand Prix to improve combustion efficiency with a pre-chamber and unspecified improvements to increase performance and reliability of the electrical elements. The team's chief of engines, Andy Cowell, later confirmed the upgrades came together with new fuel and lubricants from supplier Petronas and were specifically introduced to evaluate the team's development direction for 2016. “It's a good point to introduce and do that development work and then build [the 2016 engine] on that through the winter,” Cowell commented. As of the first Grand Prix of the season, the W06 Hybrid proved to have no match, with Hamilton and Rosberg immediately taking the top spots on the podium. As the season progressed, no team was able to close the gap. In the 19 races of the 2015 season, Mercedes won 18, including twelve 1-2 finishes (63.15%). 23 podiums were scored (84.21%) and the team scored a massive 703 out of 817 Championship points (86.04%).